The Giving Back guide lists 1000 Berkshire nonprofits by category, and is designed to connect these organizations to people who want to “give back” either as volunteers or donors. Listings are free for all Berkshire County nonprofits. This annual publication also includes full-page profiles of nonprofits, articles, advertisements, inspirational quotes, and more. The Giving Back guide is distributed free throughout the county in popular community gathering places such as coffee shops, banks, markets, and restaurants. Get your copy in the mail! EXPLORE THE CURRENT GUIDE ONLINE! The Nonprofit Center published the third annual Giving Back Guide in October 2018. 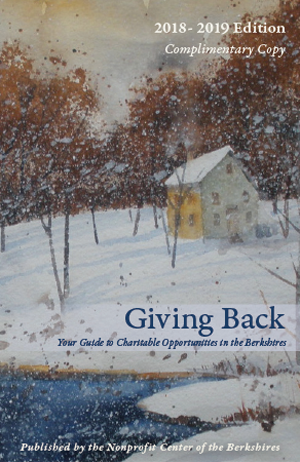 5,000 copies of “Giving Back: Your Guide to Charitable Opportunities in the Berkshires” are being distributed throughout Berkshire County. A DIRECTORY of all 1000+ Berkshire County Nonprofits organized by category. All nonprofits are listed free of charge. Please click here to check your current listing online. FULL PAGE NONPROFIT PROFILES designed to help organizations share information with potential donors about ways to get involved and support their mission. NPC members pay $75/Nonmembers $125. Click here to view a sample profile and email updates to elizabeth@npcberkshires.org. If you would like to raise your profile with a full page that includes mission statement, photo, program description, ways to help, fast facts, a testimonial, your logo and address, email elizabeth@npcberkshires.org for details. The deadline for reserving your profile page in “Giving Back” is Thursday, August 22, 2019. PURCHASE A COLOR BLOCK. Individuals can purchase a colorful block ad for $50 with the phrase “I Believe in Giving Back” or “We Believe in Giving Back” along with your name (s). Your purchase helps us distribute 5,000 free copies of the guide throughout the community. Click here to offer your support. BUSINESS PROVIDERS display advertising featuring services of interest to both nonprofits and residents; everything from accounting, legal and financial services, to graphic design, photography and consulting. Our advertising partners make it possible to distribute the Giving Back Guide FREE all over Berkshire County. For more information on advertising opportunities, email info@npcberkshires.org. 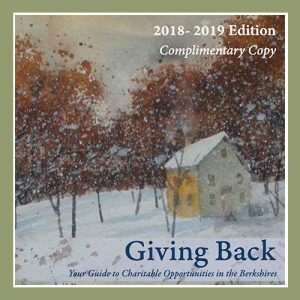 “Giving Back: Your Guide to Charitable Opportunities in the Berkshires” will be published in October 2019 with an initial print run of 5,000 copies. These will be distributed free throughout Berkshire County in real estate offices, town halls, banks, businesses, brokerage firms, schools and anywhere one expects to find community members interested in getting involved and supporting nonprofits. “Giving Back” targets second homeowners, people relocating or retiring here, and full time residents looking for more information about our local nonprofits. Your advertising support helps underwrite the cost of this publication, making participation for nonprofits accessible and affordable. Show your support for the nonprofit sector by purchasing an ad and helping to make this invaluable community resource available to all. Advertising is open to all businesses that wish to show their support of the nonprofit sector, and all nonprofits that wish to promote their missions and programs. For more information on advertising opportunities, email info@npcberkshires.org.